This summer, let your imagination run free. Journey into an awe-inspiring world of action fantasy and visual wonder with popular French comics heroine Adèle Blanc-Sec as she leaps from the pages to the screen! On August 13, 2013, Shout! Factory, in collaboration with EuropaCorp, invite families and the young-at-heart across America to be captivated by one of the most highly anticipated international motion pictures of all time when Luc Besson’s The Extraordinary Adventures of Adele Blanc-Sec unleashes on DVD and on two-disc BLU-RAY COMBO PACK. The Blu-ray combo pack allows viewers to enjoy THE EXTRAORDINARY ADVENTURES OF ADÈLE BLANC-SEC on the platform of their choice and includes spectacular movie presentation on Blu-ray, DVD and a digital copy of the movie compatible with PC, MAC, iTunes, iPhone and AppleTV. Brimming with heart-pounding action, breathtaking cinematography and visceral special effects, this acclaimed feature illustrates the magical power of moviemaking, and delivers wildly entertaining cinematic adventure filled with humor, incredible action, mystery and lush Parisian period details that the whole family will enjoy! Both Blu-ray combo pack and DVD editions offer English and French audio tracks, English subtitles. Insightful bonus features take viewers behind- the-scenes as director Luc Besson and the cast share their passion in bringing this timeless tale to the screen. Available in stores nationwide, THE EXTRAORDINARY ADVENTURES OF ADÈLE BLANC-SEC Blu-ray combo pack is priced to own with a suggested retail price of $24.97, and $14.97 for the DVD. 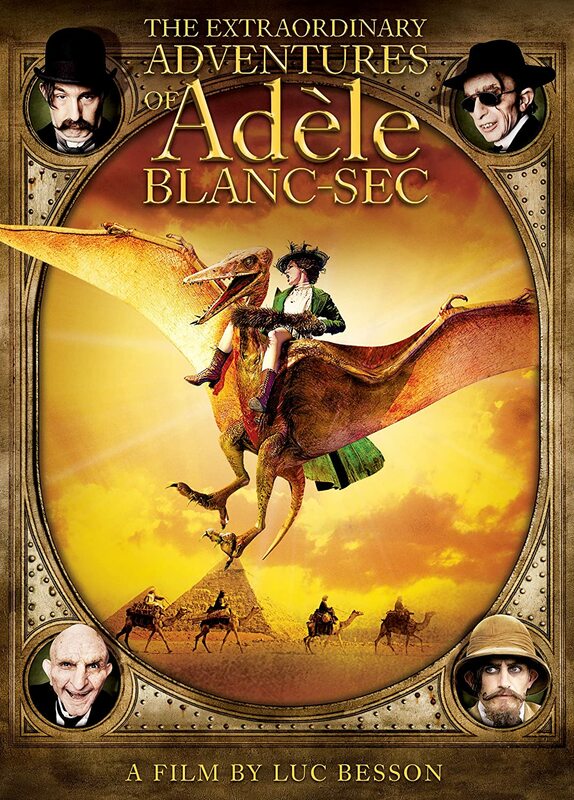 THE EXTRAORDINARY ADVENTURES OF ADÈLE BLANC-SEC The Director’s Cut Edition Two-Disc Blu-ray+DVD Combo Pack will arrive in stores this Fall 2013. Though this movie is dubbed in English, the movie itself was a fun romp for all. What I loved most was how the movie did not give anything away. You really have no clue where the movie is going, which is really what half the fun is. The movie is beautifully done and the cinematography is simply stunning. On top of this there is some great acting in this as well. There is a ton of action throughout and the movie kept me engaged from beginning to end. In looking further into this movie, I have to say that I had no clue that the movie had a tie to a graphical novel series, but now in seeing this I looked further into this and the novels were great too. Overall, I was really impressed with the movie and the acting and you will be too!